Do you find yourself wanting a fun and engaging way to get real-time data on your students’ phonics skills? Sure you can pull your students aside for old-school assessments but that is not fun for you OR for them. 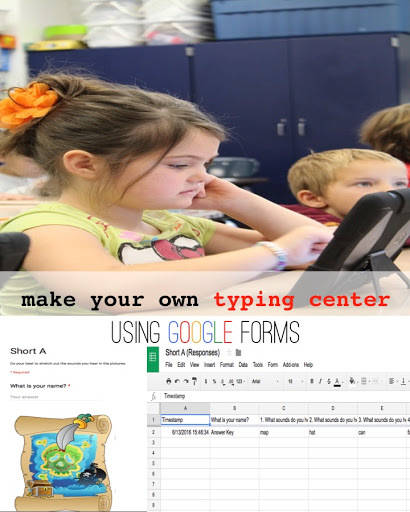 Today, I wanted to share with you an easy-to-make Typing Center using Google Forms. You’ll not only get the real-time data in an easy-to-read spreadsheet, you’ll also have an engaging center for your students during their ELA computer time. To determine if this is something you’d be interested in making for your students, check out my REALLY simple typing center here. Don’t worry – I made a duplicate version of this form so you are more than welcome to type in your own responses. I’ll show you how to duplicate your form next week! 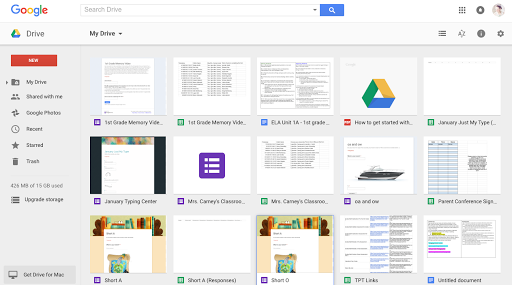 If you haven’t already, you’ll want to click this link to go to Google Drive. Once there, you’ll click “Sign Up!” The Google Wizards will make sure you get situated correctly. When you’re done, come back here! You should see a VERY purple page now that says “Untitled Form.” I like to make things pretty before I get started so we’re going to customize the look of our page before we keep going. Look at the top of your page. You’ll see a lot of small icons, one of them looks like a paint palette. 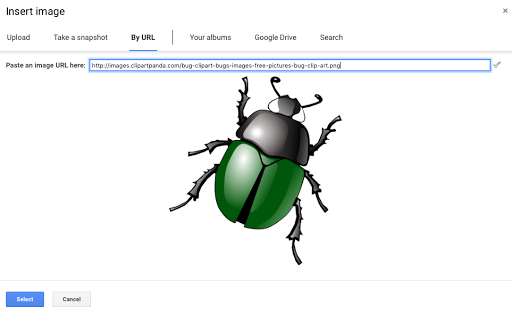 Click this icon and customize the color and/or background of your page. You’ll also want to go ahead and give your form a name. You can rename your form by simply clicking on the text and typing what you’d like. You’ve probably still got a big ol’ “Untitled Question” on your form. You’ll want to think about what type of questions you plan to ask your students on this form. For my first graders, I want to use my form to see how they are hearing sounds and stretching out those sounds. I will need to look at the list of choices the form gives me to think about what best suits my needs. Click where it says “Multiple choice” next to Untitled Question. Make your choice. From here on out, mine will resemble the “short answer” option. You’ll also want to click the slider on this section so that it becomes required. 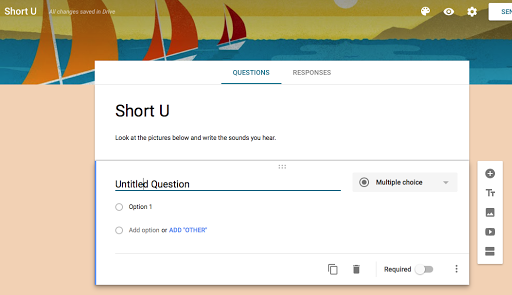 You want to make sure your students answer all of your questions so by clicking this slider, it will prompt them to go back and check before they can move on. You’ve now chosen the type of question and made it required, but you still don’t have an actual question! For my purposes, I wanted the students to look at a picture and write the sounds they hear. So, I need to add an image. Look to the right of the question box and you’ll see this toolbar. Go back to your Google Form and select “By URL.” Paste the link you just copied into the text box. 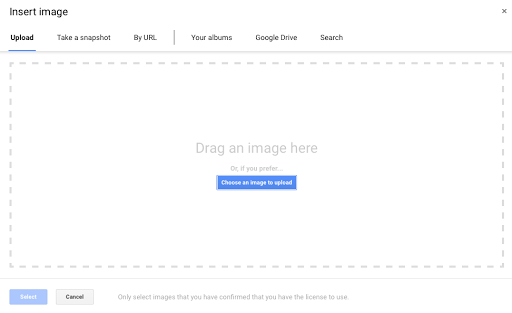 Your image should appear! I don’t know why but I always think that part is so COOL! The difference between adding a question and adding a section is a Next button. 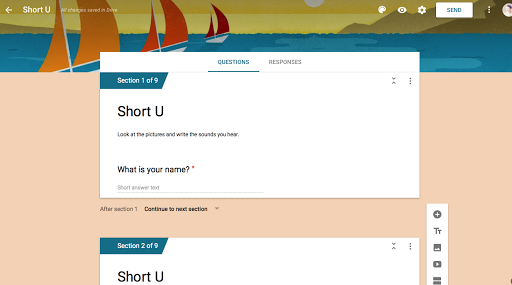 By adding a question, your students will simply continue scrolling down the page until they have answered all of your questions. By adding a section, your students will only see one question at a time and will simply click Next when they’re ready (think: MAP or FAST Testing). NOW: How do you get the data from all of this?!?!?! 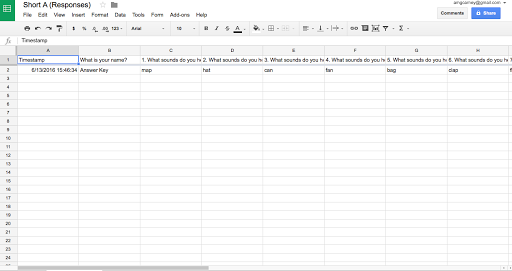 Because my Google Form is designed for a 15 minute center rotation, I only included 8 questions. You can include however many you’d like. 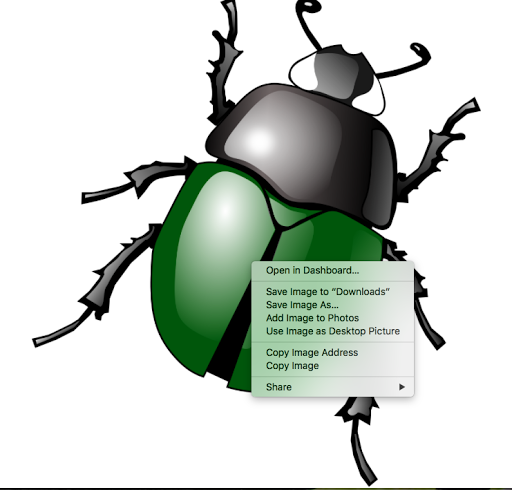 When you’ve input all of your pictures and questions, you’re ready to set up the Responses. Scroll cllllll the way back to the top until you see “Questions” and “Responses” tabs above your first question. “Questions” should be highlighted because you’ve been working on questions thus far! Click “Responses.” You will see a little green box with two white lines. Click that button to “Create Spreadsheet.” I promise it’s not scary! Select Create a new spreadsheet. 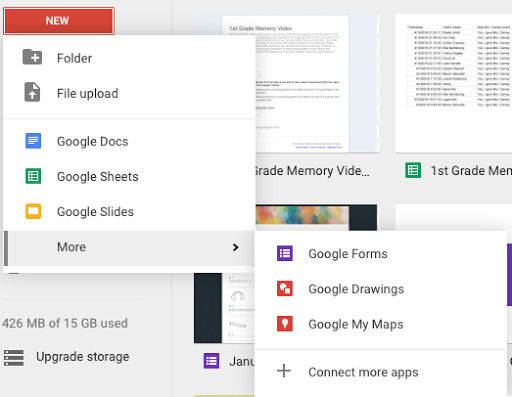 Look through your files – you should see your new center and the spreadsheet right next to it! Click your Response form and you’ll see all of your questions lined up ready to go. You’ll see that my form has one response already filled in. I went to the “preview” of my form (go back to your home and click your question page. There will be an eyeball at the top that means Preview. Click that and do your center). I input my name as “Answer Key” and then put all of the correct answers in. 2. 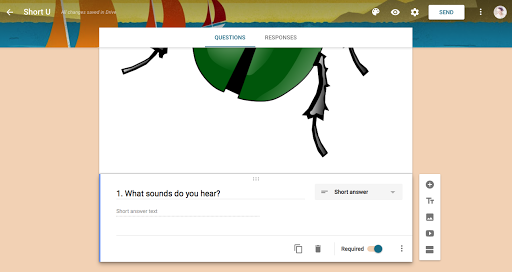 I now have a reference of correct answers when I go back to see what my students have typed! I know this was long but THANK YOU for bearing with me! Come back soon to see how you can easily DUPLICATE this form and just retype your questions for each phonics skill you teach. Even better, I’ll also show you how to set it up easily on your desktop for student access.